It's a time of firsts for ThingOne, and in this case ThingTwo came too. I took today off work and the four of us went to London on the train. ThingOne's never been into central London before (ThingTwo has, but only to go for allergy tests in a hospital - I don't think she got much out of those visits). The train journey in was enough of a treat for them. The pair of them were quite excited by it all. Belle tends just to be happy to have all four of us out together, so she'd have been happy with a trip to Corby. We then took a ride on a tube train (ThingOne, wide eyed) to Piccadilly Circus. I showed the girls where I used to work when Anne and I lived in London, and walked to Horse Guards Parade to see guards on horses, parading. (ThingOne was a little scared of them - not unreasonably). We then went up Whitehall and ThingOne was interested to see where Gordon Brown lived, and even more interested to see Big Ben looming on the horizon. We arrived there at 11am precisely, so ThingOne got to check that the bell could count to eleven correctly (it passed). We also showed her the Thames from Westminster Bridge. If this all sounds a little rushed, it was a bit. Not too bad, but we didn't linger anywhere except St James's Park for the picnic. We wanted to fit in a few of the things ThingOne knew about or recognised, but were conscious the kids would both be worn out so wanted to give ourselves the option to cut it short if needed. We were happy not to see everything if needed. There's lots more we'd like to show them. I'd especially like to show ThingOne Tower Bridge and the Tower of London (which is a little more like the fairy tale castle she'd want to see) but there's plenty of time for all that. 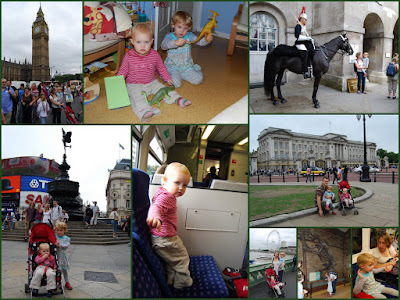 They were fine after lunch, so we took the tube to South Ken for the Natural History Museum. It's free to get in, so we figured twenty minutes to see some dinosaurs would be all they needed. However, we learned today that you don't go to the Natural History Museum in summer school holidays. We queued for about 30 minutes to get in (perhaps longer?) and if we'd have wanted to get into the proper dinosaur area we'd have had to queue for a further 45 minutes inside. Blimey! Do kids like dinosaurs or something? Fortunately there's a big dinosaur skeleton in the entrance hall, and some other smaller skeletons and fossils around the place, so ThingOne was pretty taken aback by it (and had no idea she was missing anything). Belle was also impressed, surprisingly. We didn't realise she likes dinosaurs, but she was pretty enthusiastic about it all. We looked around some other, quieter parts of the museum, had a drink and snack in the cafe, and then went to the shop before we left. We let each of them choose a £3 dinosaur toy in the shop. This seemed to excite ThingOne a lot. She's not used to being able to choose something in a shop that she can have. We are cruel, stingy parents. Then it was tube and train home with two very tired girls and two almost-as-tired parents. The train home was busy, so Anne and I divided the girls between us and sat separately. I had a relaxing journey reading comics on my iPod Touch while Belle slept. Anne had a tiring journey with a toddler who would not stop talking despite being almost-hallucinating with exhaustion. When we got home we put them in front of some Baby Einstein for 20 minutes to unwind as they bashed their dinosaurs together, roaring.